Shipping is FREE anywhere in the world for Replacement Lenses.. However, if you need to order Custom Cut Lenses, or just want to have your lenses professionally installed, we must have your frames. Customer outside of Australia must send their sunglasses to our facilities in Australia for servicing. Customers are charged $14.95 Australian dollars for the return shipment of your sunglasses at checkout. This included cost is only for the return of your sunglasses and does not include postage from your home country to Australia. However, we find that using most 1st class air mail services are economical, safe, and fast. You can expect to pay between $10 and $13 to get your sunglasses to Australia in as little 5-15 days. 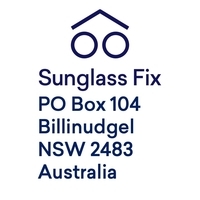 Once serviced, The Sunglass Fix packs your sunglasses and returns them to your home through DHL Parcel Post with tracking*. You are notified by email they are on their way. The shipment is tracked and the service is very dependable. Our mailing labels are all computer generated from your order shipping details and we have an outstanding track record of safe returns. Please check estimated shipping times but a typical example is 5-15 days to the United States. then they can contact The Sunglass Fix to arrange insured mail. However, the cost may increase dramatically. While extremely rare, The Sunglass Fix assumes no responsibility for lost of damaged sunglasses through international shipments. Please ensure your address information on your receipt is accurate as it is the same address used to generate your mailing label.